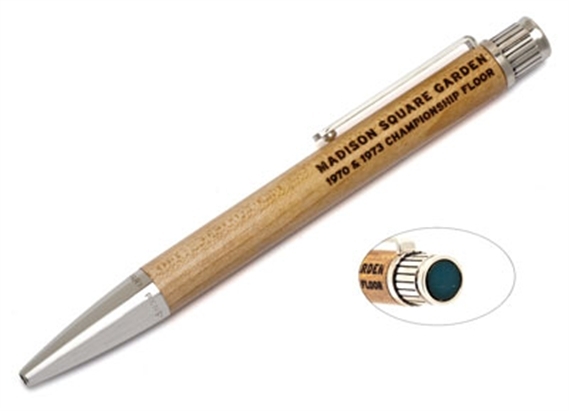 Order your Tokens and Icons Madison Square Garden Rollerball Pen today from FahrneysPens.com. Fine Pens, Refills & Luxurious Gifts – great prices & fast shipping. Hold a piece of sports history in your hand! We’re proud to offer these handsome collector’s accessories celebrating Madison Square Garden™. If you’re a fan of the Knicks, you’ll love the rollerball pen handcrafted in solid maple boards from the basketball court – the very floor that hosted the NBA™ championships between the Knicks and the Lakers in 1970 and 1973. Lovingly built and polished by hand to show off the natural wood grain, the rollerballs (or ball pen, if you prefer) are trimmed in rhodium plate and feature an inlaid disk of the wood relic on the twist-top mechanism. All pens are officially licensed and come gift boxed with a certificate of authenticity. Finishes may vary.